Władysław III of Poland was born on 31 October 1424. He was named King of Poland when he was 10 years old and King of Hungary at the age of 16. Very young kings are usually surrounded by advisors who often want to enjoy and consolidate their own power, rather than offer unselfish loyalty to king and country. Cardinal Olešnicki ran the country more than Władysław did, insulating the young king from reality and the ability to make sound judgments. 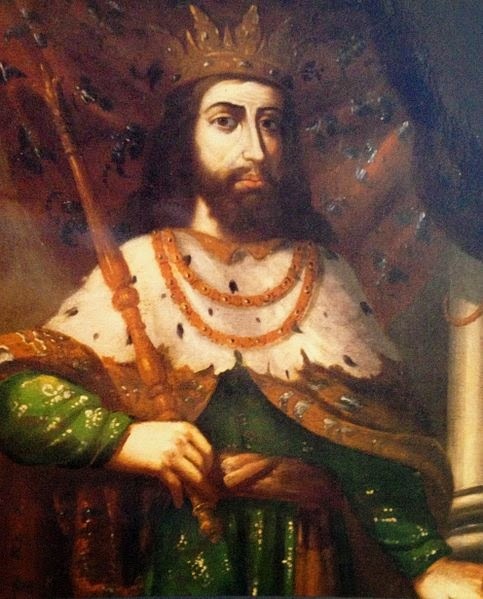 Therefore, when Władysław was 18 and had become King of Hungary after a two-year war (the widow of the previous king wanted to keep the throne for her infant son and not see it go to a Polish monarch), he decided to keep his army together and attempt a greater prize. The Christian Władysław decided it would be a glorious undertaking to attack the pagan Turks in a crusade, breaking a ten-year truce with the powerful Ottoman Empire. Plans were made, and promises were gathered from Venice and papal forces for help. Unfortunately for Władysław, the mercenary Venetians also had an arrangement with the Turks, and used their fleet to ferry 60,000 Turks from Asia to where Władysław's army (of only 20,000) was camped. The end result was the Battle of Varna on 10 November 1444. The Polish army was defeated soundly and Władysław was beheaded. Rumors that his head was taken to the Ottoman court are not substantiated. His own forces never found his body. A strange Portuguese legend accounts this. Supposedly, Władysław, ashamed of starting a disastrous war on false pretenses, snuck away from the losing battle and wandered as an ordinary pilgrim to the Holy Land, looking for forgiveness. He became a Knight of Saint Catherine of Mount Sinai. He later traveled to Madeira (an island west of Portugal) to live a quiet life, becoming known as Henry the German. Hearing the rumor that Władysław was alive and hiding in Madeira, a group of Polish monks traveled to investigate. They were satisfied that he was Władysław, but he would not be persuaded to return to Poland and ascend the throne. Little is known of the figure called Bruno the Saxon, except that he was a monk attached to the household of Archbishop Werner of Magdeburg. 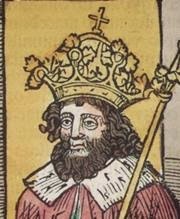 Werner was an enemy of Holy Roman Emperor Henry IV, even joining a revolt against him. 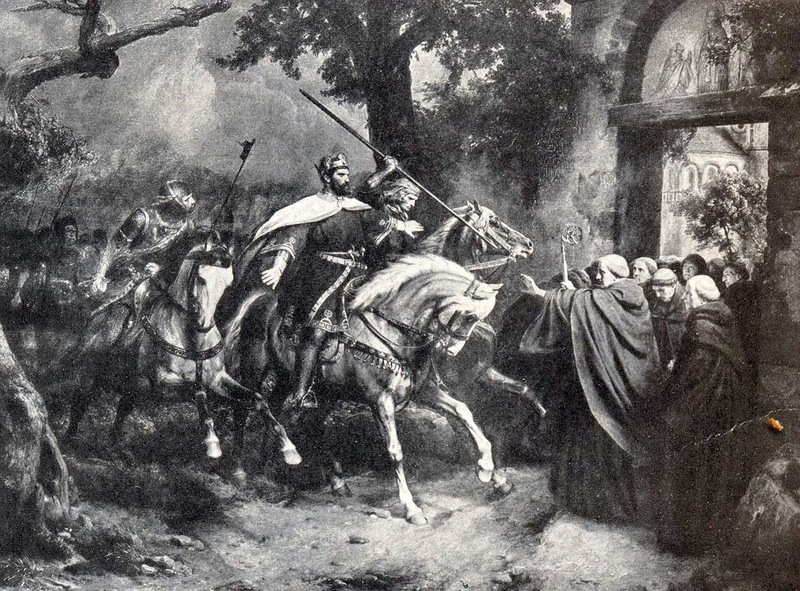 After Werner's death in 1078, Bruno joined the household of another Werner, this one the Bishop of Merseburg (because of which Bruno is sometimes called Bruno von Merseburg). Bruno's Historia de Bello Saxonico ["History of the Saxon Wars"] is dedicated to Werner of Merseburg. The Historia recounts the struggles between the Saxons and Henry IV. Although Bruno is a Saxon, he seems to treat Henry more fairly than some other historians and figures of the time. Although he characterized the young Henry as arrogant and as someone who should have listened to his mother more, he also attributes problems with him to the evil influence of others, notably Adalbert, Archbishop of Hamburg-Bremen. Adalbert was sub-regent under Henry's mother, Agnes. Bruno felt it was good that Henry came under the influence of Archbishop Anno of Cologne (after Anno staged the Coup of Kaiserswerth), but eventually Adalbert once again replaced Anno in henry's eyes as a chief influence. Bruno seems to want to give Henry the benefit of the doubt and explain his failings as the evil influence of others. Despite obvious biases, however, Bruno provides some valuable history by giving us a taste of life at the time and by including other sources in his Historia, such as letters from Saxon bishops and other original documents. In 1062, Archbishop Anno II of Cologne and several princes decided that the 11-year-old Henry IV (the future King of the Germans and Holy Roman Emperor) needed to be liberated from the influence of his regent mother, Agnes of Poitou. He organized what is now called the Coup of Kaiserswerth. It may have been a simple "power grab" by men who wanted to run the kingdom themselves, or by men who wanted to save the kingdom from Agnes (she had given away the duchies of Bavaria, Carinthia, and Swabia). It may also be that the conspirators felt the kingdom should not be ruled by a woman. Bruno the Saxon, an 11th century monk who wrote the Historia de Bello Saxonico ["History of the Saxon Wars"] claimed that Henry's behavior prompted the drastic action, because he was arrogant and would not listen to his mother. Archbishop Anno did the right thing by taking control of Henry. For the Coup, Anno invited Agnes and Henry to stay at the palace of Kaiserswerth on the River Rhine in Dusseldorf. After dinner, the archbishop invited young Henry to see his fancy new boat. Once onboard, the boat cast off from shore. Exactly what Anno's plan was is not clear, but Henry feared for his life and jumped into the river (putting himself in far more danger than staying on the ship). One of the nobles present, Count Egbert, dove in and saved Henry. The ship was rowed to Cologne, where Henry was held until Agnes agreed to surrender the regalia. Agnes went into a convent and Archbishop Anno became regent, ruling the country until March of 1065, when the 15-year-old Henry was crowned. This sounds like a happy ending for Henry IV, but his reign would be troubled by many issues and incidents, including the Investiture Controversy. We have mentioned more than a few Holy Roman Emperors, but not any Holy Roman Empresses. Agnes of Poitou was born about 1025, the daughter of William V, Duke of Aquitaine, and Agnes of Burgundy. In November of 1043 she was married to Holy Roman Emperor Henry III (Henry was 26 and had been married before; his first wife, Gunhilda of Denmark, had died). The marriage between Henry and Agnes helped improve relations between the Holy Roman Empire and western Europe. They were crowned Emperor and Empress in 1046 by Pope Clement II. Henry III died on 5 October 1056, when he was only 38 years old, after naming his son Henry as his heir (all his other children were daughters, except for Conrad who had died a year earlier). Henry IV was barely six years old, and his mother was named his regent, taking on the managing of the affairs of the Empire. She may have been a good wife and mother, but she was not an admirable administrator. It would have been wise to maintain the kingdom for her son's eventual majority, but she let herself be persuaded to make changes like giving away valuable property—namely, all of Bavaria, Carinthia, and Swabia! She did not approve of church reform, and got involved with papal politics. She supported Pope Stephen IX, who was forced to live outside Rome, over Pope Benedict X who actually held the papal seat. In 1062, a group of aristocracy led by Archbishop Anno II of Cologne, decided (for whatever reason; guessing motive is difficult) that Henry needed to be removed from the influence of his mother. They staged what is called the Coup of Kaiserswerth. That's a story for tomorrow. Ulugh Beg is the more familiar name of Mīrzā Muhammad Tāraghay bin Shāhrukh (22 March 1394 - 27 October 1449). "Ulugh Beg" is more of a nickname, meaning "Great Ruler." He was a grandson of Tamerlane who became sultan in Samarkand while still a teenager. 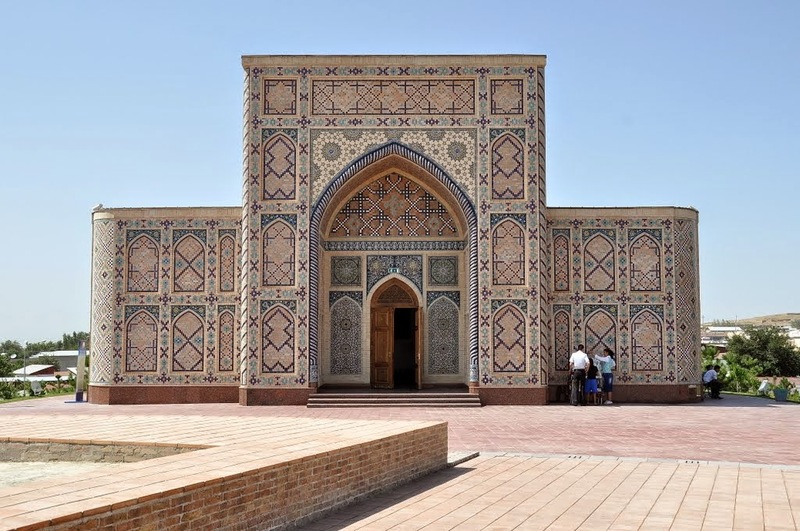 He decided to turn Samarkand into an intellectual center, building a university and inviting scholars to take up residence. 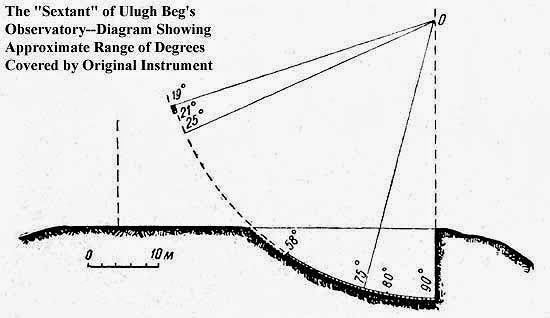 Building a giant permanent astronomical instrument was a unique idea at the time—remember that this was 200 years prior to the invention of a telescope. He created a catalog of over 1018 stars, discovering and correcting many inaccuracies in the star tables created by Ptolemy. Copies of these star charts are on display at the Ulugh Beg Observatory Museum; the originals are in the Bodleian Library in Oxford. The Wheel of Fortune is a familiar concept to many these days because of a popular game show, but the name and idea originated a lot earlier than the 20th century. Human beings recognized long ago that luck was a dish served in one of two flavors, and that one never knew what flavor one was going to get. Life had its ups and downs, and this became represented as a circle of possibilities. This was similar to the wheel of the Zodiac, turning throughout the year and bringing with it changes in life. 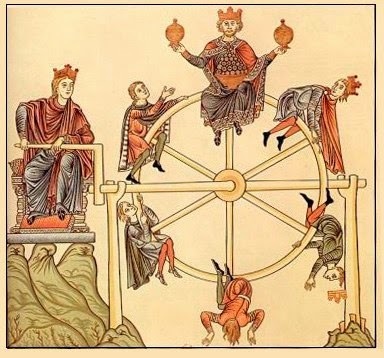 At some point, however, the Wheel of Fortune (in Latin, the Rota Fortunæ) began to be represented in a Ferris Wheel configuration, so that the "ups" and "downs" could be portrayed visually. At the top of the wheel is a man at the peak of good fortune: he is portrayed as a king. 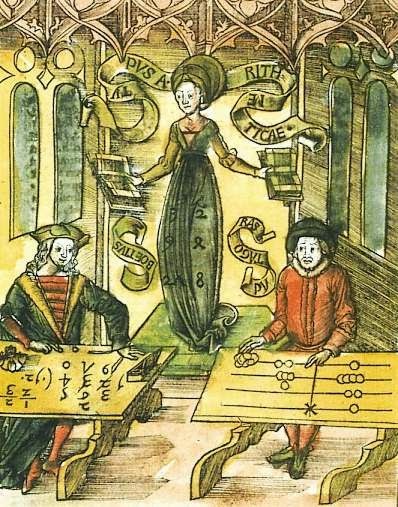 The wheel turns constantly, however—Boethius points out in his Consolation of Philosophy that, should the wheel stop turning, then she is no longer Fortune: this changeability is fundamental to what she does. Therefore (in this clockwise-turning representation), on the right side you see the one who was formerly on top, sliding down; near the bottom, his crown has fallen off. All is not dire, however, for on the left you see that fortune is turning better for someone else, who is ascending and will some day be on top. The concept existed before Boethius. An astrologer of the 2nd century BCE, Vettius Valens, refers to the Zodiac as the wheel of fortunes, and a Roman playwright of the same era, Pacuvius, puts Fortuna on a spherical rock that constantly rolls by chance. Chaucer also mentions Fortune's wheel when, in "The Monk's Tale," he recounts multiple stories of men whose fortunes went from good to bad. Boethius has been mentioned in passing before for his writing. An early philosopher whose works were very important to the Middle Ages, in life he was an important public servant from a noble family who rose very high before he fell. Anicius Manlius Severinus Boethius was born about 480 to a prominent family that had produced a couple emperors; his father became a Roman consul in 487 but died shortly thereafter, leaving Boethius to be adopted by the aristocrat and historian Symmachus. Symmachus and Boethius were fluent in Greek, which might have figured into their execution—but we are getting ahead of ourselves. Boethius went to work for Theodoric the Great, and some of his actions on behalf of the King of the Ostrogoths have survived in the records. Procuring or producing a waterclock for Theodoric to give to Gundabad of the Burgundians. Finding a lyre player to perform for King Clovis. Investigating irregularities in Theodoric's paymaster. In his famous work De consolatione philosophiæ ["The Consolation of Philosophy"], which he wrote in prison, he says that his greatest accomplishment was getting his sons, Boethius and Symmachus, appointed co-consuls in 522. Boethius did so well in his career that he was made magister officiorum ["master of duties"], responsible for overseeing all government services. That's probably where the trouble started. Kings and emperors can be mistrustful of those around them with too much power—even if the emperor gave him the power in the first place. Boethius was put in charge of reconciling the differences that had grown up between the Western Roman and Eastern Byzantine Empires. His political powers and education and ability to speak Greek (rare in the West) made him ideally suited for this. He was accused (falsely) of treasonous dealings with the Eastern Emperor Justin I against Theodoric. For this he was exiled, then executed. His adoptive father Symmachus was later put to death on the charge of collusion with Boethius to overthrow Theodoric—a charge which seems unlikely. The Consolation of Philosophy is believed to have been written while he was in exile. It covers many topics, one of which gave the modern era the title of one of its most popular game shows. But that's a story for tomorrow. *These are the four parts of the quadrivium, taught in medieval universities; it is likely that the curriculum was arranged thus because of Boethius. Inheritance is never more complicated than when a throne is involved. The stakes are too high for anyone to let slip by the chance that he can convince the world that he should rule the country involved. When Peter I of Castile (who ruled both Castile and Portugal) died in 1369, it seemed natural that his eldest surviving son, the 24-year-old Ferdinand I, would inherit the throne. Except that Peter did not have the Castilian throne to pass along. His illegitimate half-brother, Henry of Trastámara, had taken it in 1369 after defeating Peter in the (First) Castilian Civil War. Wanting to oust Peter wasn't a big surprise to much of Europe, since at the time he was more commonly known as "Pedro the Cruel" because of a ruthless administrative style that did not sit well with the aristocracy. Henry had the support of the papacy as well as France and Aragon. France was happy to get involved on the side opposing Peter because of the larger global issues: France was still in the Hundred Years War with England, and England's John of Gaunt (son of King Edward III) was married to Peter's daughter Constance. Ferdinand was now King of Portugal, but he wanted Castile as well. Just because Henry sat the throne, however, did not mean his legitimacy was incontrovertible. (He had a son who was not yet a teenager.) Upon Peter's death, King Peter IV of Aragon and King Charles II ("the Bad") of Navarre put forth claims to Castile, as did Peter I's son-in-law, John of Gaunt. (John would have liked a kingdom of his own, since the assumption was that England would go to his older brother, Edward the Black Prince). Military engagements followed. In order to avoid an unending conflict, all parties appealed to the pope. Pope Gregory IX got everyone to accept a treaty in 1371, agreeing that Peter's son Ferdinand would ascend the throne and would marry Leonora of Castile, Henry's daughter. This would link the thrones of Portugal and Castile by marriage, and everyone would be satisfied. The next difficulty was created by Ferdinand himself. Although he accepted the treaty, he fell in love with someone else: Leonor Telles de Meneses, the wife of one of his courtiers! He managed to get her forcibly divorced from her husband so that Ferdinand could marry her. With Henry's daughter spurned, he had no incentive to allow Ferdinand to become king in Henry's place. John of Gaunt plotted with Ferdinand to remove Henry from Castile, and brought an English army to help—to no avail, however, and a treaty in 1373 calmed everyone down again. Henry died in 1379, and John of Gaunt once again made a claim for the throne. Ferdinand, however, made his own treaty without English help. 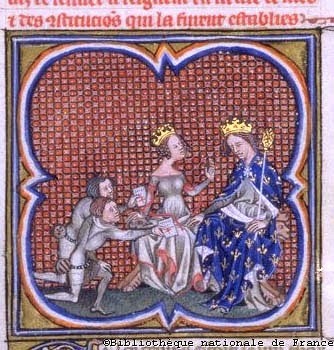 If Ferdinand's daughter Beatrice were to marry Henry's son John, then the two kingdoms could be joined by marriage to everyone's satisfaction. When Ferdinand died on 22 October 1383, he left no male heir. Beatrice's marriage to John would have taken care of Castile, but what of Portugal? The treaty was tossed away—popular sentiment was that Portugal would be annexed by Castile; Portugal needed its own king, not that of Castile!—and Ferdinand's illegitimate brother John claimed the throne, sparking a two-year period of war and political uncertainty with the French helping John of Castile and the English helping John of Portugal. When the dust settled, Portugal had gained control of many towns that were originally Castilian, and the two kingdoms were ruled separately. In 1387, John I of Portugal married Philippa of Lancaster, daughter of John of Gaunt. The alliance between Portugal and England was and remains very strong. That is not, however, the origin that the Middle Ages believed. According to the Chronica Boëmorum [Chronicle of Bohemians"] by Cosmas of Prague, the Bohemians originally lived harmoniously, without alcohol or marriage, private property or weapons. Eventually, however, evil arose, and they needed someone to lead them out of their iniquity. a man known for his age, absolutely perfect, rich and worldly in his judgements, and sophisticated. This wonderful man had no male heirs, but rather three daughters, whom nature had granted the treasures of wisdom. That is all Cosmas says about the legendary Duke Krok, although he does tell stories about his three daughters: Libuše, Kazi, and Teti—especially Libuše, the youngest and wisest (possibly the wisdom was inherited from her equally legendary Elven mother). 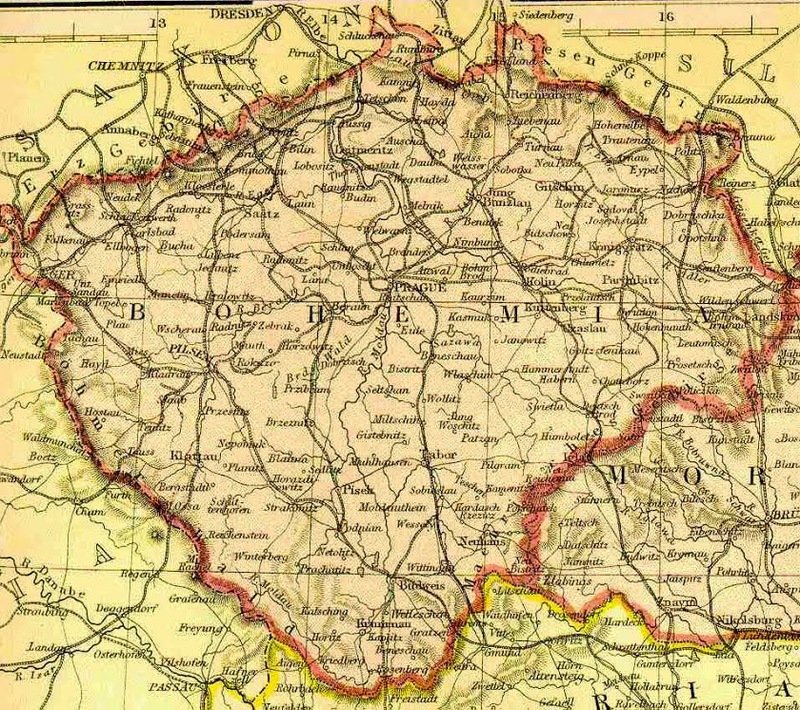 Libuše foretold the city of Prague, and married a ploughman named Premysl, with whom she founded the Premyslid Dynasty (ruling Bohemia from the 9th century to 1306). A film was made about Libuše in 2009. To Cosmas, writing in the early 12th century, the story of the founding of Bohemia needed one more element: an explanation for the name. He therefore mentions Duke Krok's companion, Duke Bohemus, whose name was given to the country. ...and that was the first and last mention of Bohemus made in chronicles. Once his name was produced to explain the name of the country, he was not needed ever again. *I am resisting the temptation to call the Bohemians "Home-Bois." Fifty years before the Norman Invasion changed the culture of Britain, the island (or parts of it) changed hands, from the English to the Danes. 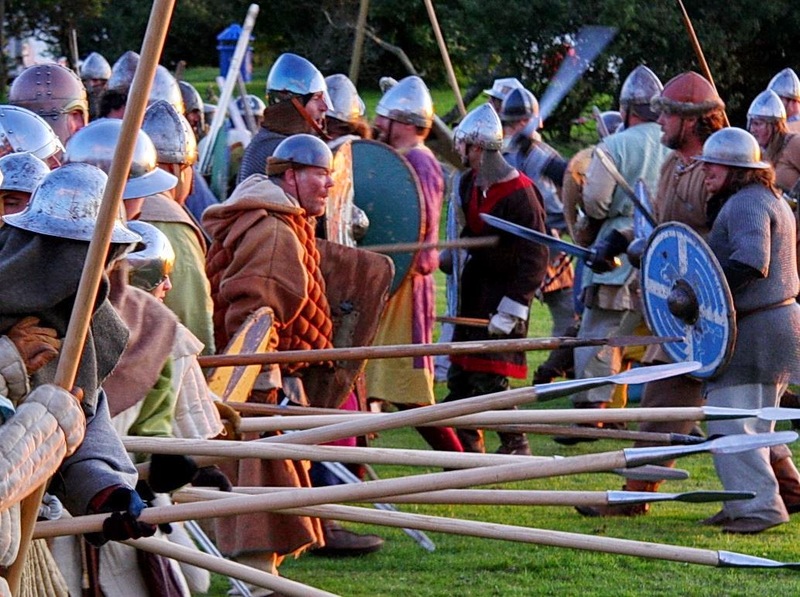 The Battle of Assandun, on 18 October 1016, was the last phase of the Danes' attempt to re-take Britain. A.D. 1016. This year came King Knute with a marine force of one hundred and sixty ships, and Alderman Edric with him, over the Thames into Mercia at Cricklade; whence they proceeded to Warwickshire, during the middle of the winter, and plundered therein, and burned, and slew all they met. 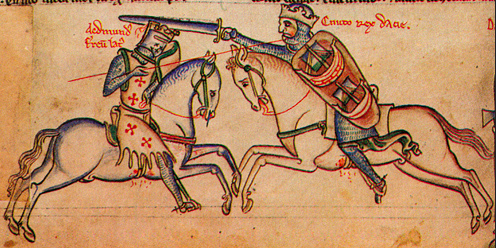 Edmund Ironside was king; his son, Edmund Ætheling, tried to gather an army, but not everyone answered the call. Then began Edmund the etheling to gather an army, which, when it was collected, could avail him nothing, unless the king were there and they had the assistance of the citizens of London. The expedition therefore was frustrated, and each man betook himself home. Eventually an army was assembled, but ultimately Cnut won. Edmund Ironside was forced to sign a treaty agreeing that Cnut would control all of England except Wessex, and that whichever died first would cede all his territory to the other, the survivor's son becoming the heir to all England. Mere weeks after signing the treaty, Edmund Ironside died on 30 November 1016. Cnut became king of all England, which he ruled for the following 20 years. Earthquakes have been in the news lately, but one of the biggest earthquakes known happened in the Middle Ages. It is called the Great Basel Earthquake, and sometimes the Earthquake of Saint Luke, because it fell in his feast day. On the evening of 18 October 1386, an earthquake took place whose force is estimated at 6.0-7.1. * It was one of the largest of the approximately 10,000 earthquakes detected in Switzerland in the last 800 years. Based on the accounts, a rumble occurred about 8:00pm, with the major quake striking at 10:00pm. Although it is impossible to determine now what the epicenter was, Basel suffered the greatest destruction (possible by virtue of being the largest set of structures affected by the earthquake). Basel was completely destroyed, as were any churches, castles, and towers within a 30-kilometer radius. Further damage was done to town buildings due to the fire caused by torches and candles being knocked over. Tremors were felt as far away as Zurich and the Île-de-France (272 miles away!). No building in Basel survived, according to reports. Considering the size of the earthquake, and the timing, you would expect casualties in the thousands. While estimates vary, an estimate by a modern risk management firm is 300 deaths in Basel. *On the Moment Scale, which has replaced the Richter Scale. There were many Khans in the Mongol Empire, but none quite like Tëmur. 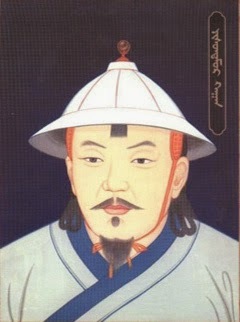 Tëmur was a grandson of Kublai Khan, born on 15 October, 1265; his father was crown prince, but died before Kublai, and when Kublai died in February 1294, the choice to succeed him was between Tëmur and his brother Gammala. A competition was held between them to see which one knew better the sayings of Genghis Khan; Tëmur won. Over the next 13 years, Tëmur continued the policies and economic reforms of his grandfather. His personal accomplishments were few, and mostly in the realm of cultural diversity and tolerance. A Mongol and a follower of Buddhism, he expanded the presence of various other religions and ethnic groups in his administration. Besides Mongols and Han Chinese, he had Muslims and a few Christians working for him. He declared that Confucians were to be respected; he hired a Confucian, Hargashun, as grand chancellor. He increased the number of Tibetans in the administration, and a Tibetan even married into his family. Kublai had been anti-Taoist, but Tëmur appointed a Taoist as head of his Orthodox Unity School. Everything passes, however. Tëmur Khan died on 10 February 1307. The Synod of Whitby was just mentioned a few days ago, and right now in 2014 there is a Vatican-called Synod going on. A synod, from Greek syn ["with"] and (h)odos ["way"], is an assembly of clergy (and sometimes laity, as in the present case) to discuss particular issues. The synod was called by Pope Stephen VII. He had been advanced in his religious career by a previous pope, Formosus (c.816 - 4 April 896). Pope Formosus was pope for about five years, during which he made a few questionable political moves, like getting involved in the conflict between Charles the Simple and Odo over the French crown and clashing with Holy Roman Emperor Guy III of Spoleto. After Formosus died, he was succeeded by Boniface VI, who lasted a matter of weeks and was succeeded in May 896 by Stephen VII, who called the Cadaver Synod. 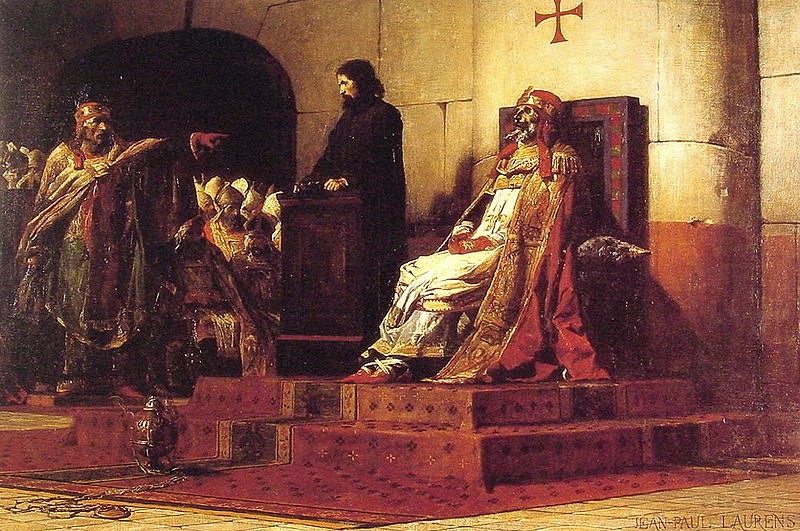 The cadaver was Pope Formosus, who was put on trial. How do you put a dead person on trial? You dig him up and put him in a chair at the synod. Since he was a pope, however, you put him in the proper vestments, giving a new twist on "respecting the dead." It was decided at the synod that he had been unworthy of the papacy due to his actions. All his decrees and decisions were declared null and void. To make the symbolism complete, they ripped off his papal garb, cut off the three fingers of his right hand that had held the consecrated Host, and threw the body into the river. The Battle of Hastings gets remembered on 14 October; that's when the forces of William of Normandy defeated the (already exhausted) forces of Harold Godwinsson at Hastings. Except it isn't...at Hastings, that is. It was fought at Senlac Hill, or Senlac Ridge, several miles from the town of Hastings. The name is the shortened form of the Norman Sanguelac ["Blood Lake"], which was their post-Conquest pun on the original name of Sandlacu ["sandy lake"]; there is a stream that crosses the fields below the hill. In fact, the site now has a town called (almost predictably) Battle, and Battle Abbey, which was built to commemorate the Norman victory. The Domesday Book commissioned in 1085 referred to it as bellum Hasestingas ["Battle of Hastings"], and yet the battle was being referred to as Senlac in other chronicles. Harold managed to reach Senlac and array his troops on the high ground, giving them a tactical advantage over the Normans below. William's forces, however, fought bravely—first with archers, then with spears—and then an accidental retreat drew the English off the high ground in pursuit, whereupon the Normans turned around and continued the fight. There were not many details written down about the battle, but we can make some assumptions. Fighting would have to take place in daylight, so a charge could not start much earlier than the 6:48am sunrise would allow. Also, sunset was at 4:54pm, and it would have been fully dark on the battlefield by 5:54pm. The moon did not rise until hours later, and so principal fighting would not have extended much past sunset. It only needed a day, however, to change the course of English history. The Synod of Whitby is a familiar name to fans of medieval history (and this blog). What is not widely known is that it was first managed by a woman, Hilda of Whitby. Hilda (c.614 - 680) was born to Hereric, a nephew of King Edwin of Northumbria. Her father was poisoned while Hilda was very young, and she was raised at King Edwin's court, where she was exposed to the preaching of St. Paulinus of York. King Edwin's entire court, including Hilda, was baptized on Easter (12 April) 627. Hilda's sister, Hereswith, became a nun at Chelles Abbey, and Hilda followed her example by taking up the monastic life. She eventually wound up taking on the management of a monastery at a coastal town called Streaneshalch in 657, which had just been founded by Oswy of Bernicia as an act of thanksgiving. Years later, the Danes would name the place Whitby (Old Norse for "white settlement"). The monastery at Whitby—which included both men and women—became famous for its learning. This was the home of Cædmon, the illiterate shepherd turned poet; Hilda allowed him to take monastic vows and encouraged him in his poetry. Her wisdom and administrative abilities were so revered that monks and aristocracy would travel to consult with her. Bede tells us that "All who knew her called her mother because of her outstanding devotion and grace." 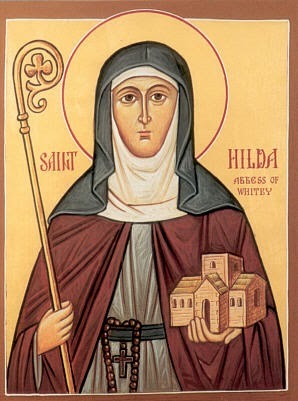 When King Oswy wanted to determine definitively whether his realm should follow Celtic or Roman Christianity, he asked Hilda to hold the synod at her abbey. The Synod of Whitby presented arguments for both sides, and Oswy chose Roman Christianity. Hilda preferred Celtic Christianity, but she accepted the decision of the king. Hilda died on 17 November 680, after several years of suffering from a constant fever that never stopped her from performing her duties. Supposedly, at her death the bells of the monastery rang out so loudly that they were heard 13 miles away. 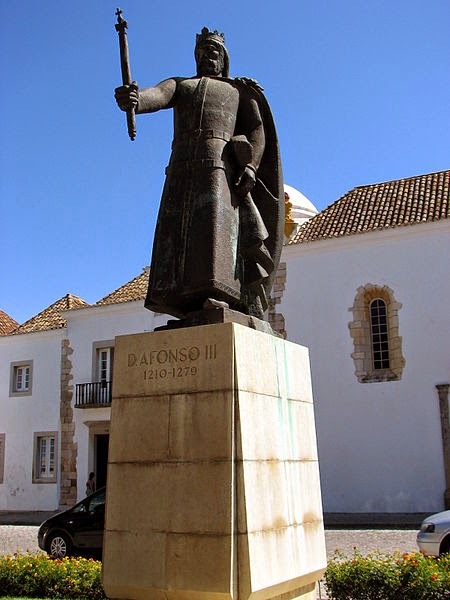 Afonso III looked like the savior for Portugal after his brother's kingship, but Afonso fell afoul of the pope himself and was removed prematurely in 1279, leaving the throne to his son Denis, who was 18 years old. Denis of Portugal was the son of Afonso and his second wife, Beatrice of Castile. Examination of his remains in 1938 reveals that he was 5'5", had auburn-colored hair, and died with a full set of teeth. The teeth are unusual, but so is the hair color, since this was far from typical in his family line. He did, however, have Henry II of England as an ancestor in both parents' lines, so that may have been the ultimate source of the reddish-brown hair. With minor diversions into necessary military engagements—his father had already done a lot to drive the Moorish occupation out of the Iberian PeninsulaDenis concentrated on administrative details. He extended his father's reforms on law and civil rights, starting a consistent criminal law code. He built new castles and towns and new social institutions to aid administration, and confirmed Portuguese as the official national language. His nickname "The Farmer" (in Portuguese, Rei Lavrador) came from his attention to land use. He helped farmers to organize and improve agricultural practices, and redistributed land for fairer use. He saw the danger of encroaching sand dunes near the town of Leiria, and halted it by having a pine forest planted which still stands today. 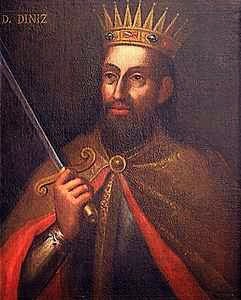 Afonso (1210 - 1279) was the second son of Afonso II of Portugal, and so never expected to inherit the throne. It was supposed to go to his older brother Sancho; and it did. Afonso was married to Matilda the Countess of Boulogne in 1238, and went to France to live as Count of Boulogne. Sancho the Pious (1209 - 1248) became king in 1223. He was good at military decisions, but not an efficient administrator, nor did he do anything to mediate disputes between the middle class and the church. Strife in Portugal became so bad that the archbishop appealed to the pope. Between papal disapproval and the Portuguese nobles disliking Sancho's style, he had to go. He was deposed in December 1247—officially ordered out by Pope Innocent IV—and died one month later. Afonso was summoned from Boulogne, and had to give up his right to the position there in 1248. Besides the position of Count, he gave up the Countess: he divorced Matilda in 1253 and married Beatrice of Castile. Avoiding the mistakes of his brother, Afonso III of Portugal paid close attention to the needs of the people. He created the Cortes, a parliament that included the nobility, clergy, and the bourgeoisie. He created laws preventing the aristocracy from exploiting the lower classes. He ensured that arrests had to be presented to a judge to determine the type and length of detention. Unfortunately, taxation of the Church may have been the step that led to his excommunication. The throne then went to his son, Denis, who was only 18 years old. The Carthusians have been mentioned here before, when Geert Groote gave away all his possessions to that order. A few days ago was the anniversary of the death (6 October 1101) of the founder of the Carthusians, Bruno of Cologne. Bruno eventually gave up the administrative duties, refusing the rille of a bishop for something more contemplative. 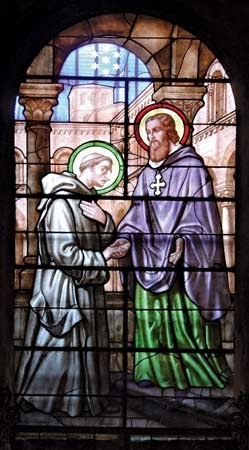 He first spent time with Robert of Molesme, who later founded the Cistercian Order. When he founded his own order, in 1084, Bruno decided it would be for both men and women. No abbots, because there would be no abbeys; a hermitage would be overseen by a prior. Priests and nuns (or lay brothers and sisters) would be hermits, shutting themselves off from the outside world in small cells. The day would be spent in prayer and labor...and silence. As penance for the death of St. Thomas Becket, King Henry II built a Carthusian charter house in 1182 in Somerset. Lionel, the son of King Edward III of England and Queen Philippa, was born in Antwerp in Flanders in 1338 during the start of the Hundred Years War. He was betrothed at the age of three to the nine-year-old Elizabeth de Burgh, sole heiress to the Earl of Ulster. They were married in 1355, and Lionel became the Earl of Ulster. An earl's household is a grand one, especially if he's also a son of the king. 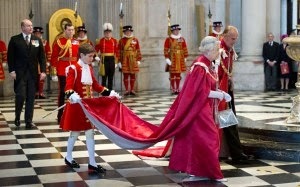 His wife, if she is the Countess of Ulster, also has a great household with many servants. Into Elizabeth's household, from 1356 to 1359, came a young boy named Geoffrey. 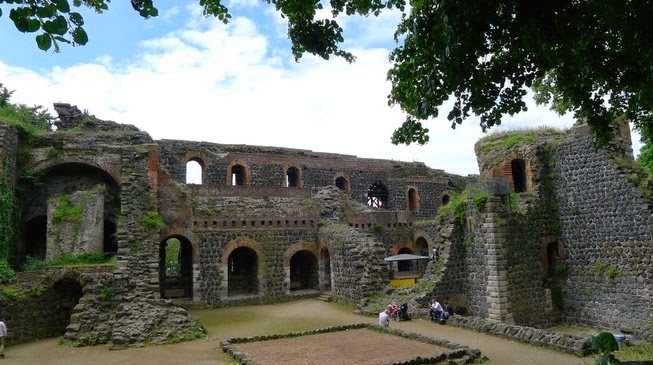 His father, vintner John Chaucer, had actually accompanied Lionel's parents on the Flanders trip on which Lionel was born, and had been put in charge of the king's wine imports in Southampton. These connections gave him the chance to place his son in service to the aristocracy, which could open doors for future careers, including that of a knight. A boy could become a page at the age of seven. Pages would learn to serve at table, carry messages or perform small daily tasks. They might care for the household's clothing. They were also likely to engage in military training against the day when they might become a knight or soldier. In 1359, Geoffrey Chaucer was taken from the Countess of Ulster and put under Lionel in order to add to the troops that Lionel would command during that phase of the Hundred Years War. There was, however, one link to the Countess of Ulster later in his life: Chaucer married Philippa Roet, who started as a lady-in-waiting in the household of the Countess of Ulster. Let us call this the story of a marriage, and a coincidence. Charles the Bald (823 - 877), a grandson of Charlemagne, was King of West Francia, King of Italy (but only for two years), and Holy Roman Emperor Charles II. His first wife was Ermentrude of Orléans. Ermentrude's father was Odo, the Count of Orléans, who at one time was exiled by Lothair I (795 - 855), Charles the Bald's half-brother. Lothair did not want his half-brother Charles to inherit anything from the family territories and thereby reduce his and his full brothers' realms. Since Lothair had grudges against both Odo and Charles, a match between the two families probably did not sit well with him. Little is known of Ermentrude, although she apparently was good at embroidery. Charles gave her Chelles Abbey. Having a religious institution in her possession came in handy when she left Charles in 866 after he executed her brother William (for rebellion). Charles died on 6 October 877. 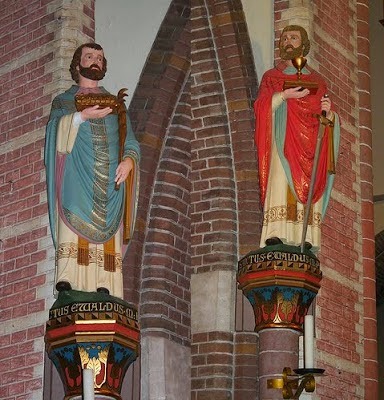 Statues of the two Ewalds, in the church at Cologne. Although the Saxons were not converted to Christianity until Charlemagne did it by force in the 8th century, there were other attempts by missionaries to do so. One attempt was made by a pair of friends, both named Ewald. Ewald the Fair and Ewald the Black were both born in Northumbria and educated in Ireland. Their nicknames were the result of their appearance and not an evaluation of their personalities. Struck with zeal for converting Germans, they traveled to Saxony c.690 where they made the acquaintance of the steward of one of the tribal chieftains in Aplerbeck. The steward said that he would (eventually) introduce them to the chieftain. During the intervening days, the Ewalds conducted themselves as expected of pious missionaries: they prayed regularly, said Mass for themselves, and recited the canonical hours (prayers meant for different parts of the day). Other Saxons, observing these rituals, feared that the Ewalds were going to try to convert their chieftain to Christianity and eliminate all of their cherished local religious customs and temples. They decided to eliminate the Ewalds instead. On 3 October 695 (or 692) Ewald the Fair was killed with a sword. Ewald the Black, the cleverer of the two, was seen as the leader and deserving of something more. They tortured him, ripping his limbs apart. The bodies were thrown into the Rhine. 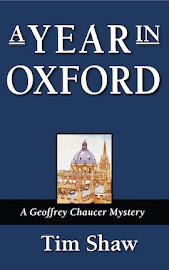 According to Bede, when the chieftain heard of what happened, he had the murderers killed. But the last was not heard of the bodies of the Ewalds: they floated upstream for 40 miles, a heavenly light shining above them, until they reached a place where the Ewalds' companions were camped. The two were buried nearby, but disinterred by Pepin the Short and moved to the church of St. Cunibert in Cologne. Stormy weather struck the Norwegian fleet on the night of 30 September 1263; the next morning (1 October) found several ships driven aground on the Scottish mainland. Scottish archers found them and started shooting at the crews. The Norwegians rallied and fought back, reinforced with more men from other ships; joined by King Hakon, they camped ashore for the night. 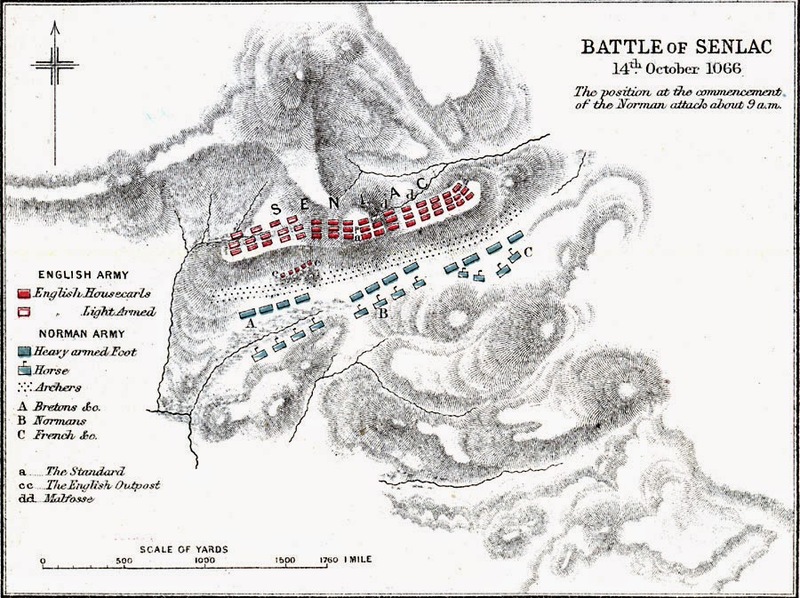 On 2 October, Alexander's forces arrived and the Battle of Largs began. Although there is a brief mention in the Chronicle of Melrose and more detail in Hakonar saga Hakonarsonar ["The Saga of Hakon Hakonarson"] by Snorri Sturluson, it is impossible to know exactly how many men were on each side and how the battle was fought. Local records show that the Earl of Menteith maintained 120 sergeants, which gives a clue to how many soldiers might come from an area. The Saga says Hakon, with a force of 700+ men, stayed on the beach while about 200 men took the high ground a short way inland. Supposedly, Alexander's approach prompted the men on the high ground to descend, fearing that they would be cut off from the main Norwegian force. Their hasty rush down from the high ground looked like a necessary retreat to the Norwegians on the beach, and they fled to their ships. In the chaos of the retreat, they took heavy casualties from the Scottish, who used cavalry with armored horses, archers, and some form of catapult. The Norwegians returned to collect their dead; Alexander allowed them. They then sailed to the Hebrides and later to Orkney, where Hakon died in December (he was 59 years old). Negotiations between Alexander and the Norwegians over the disputed territories continued, but slowly. Alexander built up his forces on land while Hakon's fleet suffered over the winter. Although the Battle of Largs was not decisive in any way, ultimately the aftermath led to a wearing down of Norwegian morale. In 1266, the Treaty of Perth created peace between the two countries, and gave the Hebrides and the Isle of Mann back to Scotland. If you look at the top of the globe, you realize how seafarers from Norway could easily dip south to Scotland on their way to colonize Iceland. In fact, Scotland was a frequently harassed target of Vikings from Norway in the Middle Ages. By the 9th century there was a Scandinavian settlement on the western shores of Scotland and in several of their island chains. This long-standing presence was one of the reasons that Harald Hardrada felt he had a claim to England after the death of Edward the Confessor. Various groups of islands around Scotland paid allegiance to the kings of Norway up through the 13th century. In 1249, King Alexander II of Scotland tried to gain back some territory; he offered to buy Argyll and the Hebrides from King Hakon Hakonarson; being rebuffed, Alexander launched a military campaign to take them, but died before he could fulfill his purpose. His son, Alexander III, was not even 10 years old, and so his attempt to free Scottish lands from Norwegian occupation would not come until much later. It came in 1262: Alexander tried (unsuccessfully) purchasing the Hebrides again, and then attacked Skye. Hakon responded with what the Icelandic Annals considered the largest force to set sail from Norway. When he reached Scotland, the Norwegian locals were not exactly happy to see him: self-rule had been the norm for years. There was a failed attempt to negotiate between the two nations over possession of some islands, after which Hakon split his fleet up to harass different parts of Scotland. What happened next will be a subject for tomorrow.